Gold Prospecting and Panning in Indiana. Like the other states surrounding it, Indiana has limited gold that was left behind by glacial deposits thousands of years ago. There are no commercial gold mining operations in Indiana, so official reports of gold production are quite limited. Investigating areas that are likely to concentrate gold including inside bends of streams, under and behind large boulders, and the other obvious areas that gold will accumulate will increase your chances of success. Don’t expect to find large gold here; you should be expecting smaller sized dust and flake gold, and if something larger comes along you can be pleasantly surprised. Brown County has produced quite a bit of gold for recreational gold prospectors. Check around Salt Creek, which is well known for having some nice glacial gold in its gravels. Nearby Monroe County also has several creeks that have reports of gold. Check out Sycamore, Indian and Gold Creeks. North in Morgan County, Sycamore and Gold Creek, as well as Greenhorn Creek also have fine placers. Many other creeks throughout the state have potential for gold. 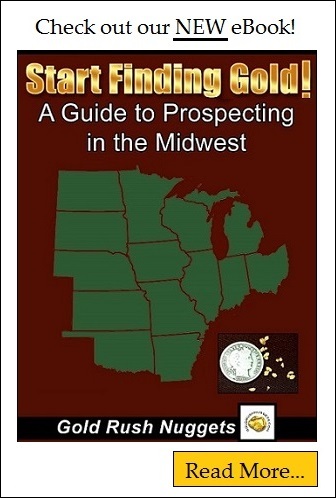 Don’t plan on getting rich gold mining in Indiana, but many prospectors are having success looking for gold here. Also be aware that the occasional garnet and diamond has been found in Indiana, so keep your eyes open while you are out exploring. Much of the land in Indiana is private property, but as permission and you have a good likelihood of getting access. Just remember to remove all your garbage, close gates, and treat it the land as if it were yours.